CarGurus has 2,819 nationwide GS 350 listings starting at $4,690. The Lexus GS 350 has been a winner ever since it hit the market back in 2007. Unlike many Japanese luxury cars, which have trouble keeping up with the strong German competition, the GS 350 has proven itself time and again, showing the world it is just as good--if not better--than its rivals from Munich, Stuttgart, and Ingolstadt. So what makes the GS 350 so great? Its rock-solid reliability is the first thing that comes to mind. Lexus has built a reputation for producing extremely reliable cars and the GS 350 is no exception, a serious plus when many of its competitors struggle with their own reliability. Couple that with the car's mean good looks and it's easy to see why so many buyers opt for this plush cruiser from Nagoya. Each of the GS 350's 4 trims--Base, AWD, F SPORT, and F SPORT AWD--packs Lexus' powerful 311-hp 3.5-liter 6-cylinder engine. That's good for fuel economy of 20 mpg city/29 highway/23 combined on rear-wheel-drive (RWD) trims (19/28/22 for RWD trims with the F SPORT Package) and 19/26/22 on all-wheel drive (AWD) versions (19/28/22 on AWD trims with F SPORT). Not bad for a 5-seat midsize luxury sedan capable of hitting 130 mph. Linking that engine to the wheels on RWD trims is an 8-speed automatic transmission with paddle shifters; AWD trims feature a 6-speed automatic, also with paddle shifters. Trunk space on the GS 350 is 16.2 cubic feet. Hop into the GS 350 Base and you'll find it hard to believe you're in the base model of any car. With standard features like perforated leather seats, a power moonroof, 10-way power front seats, and dual-zone automatic climate control, the Base offers more than enough to keep most people happy. But for those who demand even more luxury, Lexus delivers. The Base also boasts standard auto-dimming mirrors, a 12.3-inch color touchscreen with navigation, Bluetooth and USB connectivity, Lexus' Enform infotainment system, and selectable driving modes. On the safety side, a backup camera, blindspot monitor with rear cross-traffic alert, 4-wheel antilock brakes, traction control, and electronic stability control are all standard. For a little extra, you can add things like a Mark Levinson 15-speaker premium audio system, park assist, a power trunk, a heated steering wheel, and a color heads-up display. The Lexus Safety System--which adds a pre-collision system, radar cruise control, lane-keeping assist, and lane departure warning--is available in various iterations as part of option packages, as is the Luxury Package, which adds 18-way power front seats and 3-zone automatic climate control. Moving up the chain slightly, the AWD version offers the same standard features as the Base, but packs a few more available options and packages. These include the Cold Weather Package, which adds headlight washers, a windshield-wiper deicer, and water-repellant windows on the front doors--a steal for many Northerners at $290. A Premium Package is also available for those who want heated and ventilated front seats along with the rain-sensing wipers. Step up to the F SPORT and you'll really get to see what makes the GS 350 special. 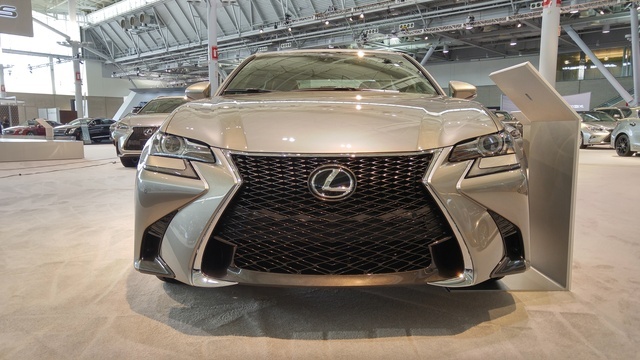 With the F SPORT, Lexus takes the already aggressive-looking GS 350 and makes it downright sinister. That styling isn't all for show, either. Available in both RWD and AWD trims, the F SPORT comes with an adaptive suspension and Lexus' Dynamic Handling system, which itself includes Dynamic Rear Steering: at high speeds, all 4 wheels turn together for better handling, while at low speeds the rear wheels turn in the opposite direction of the front wheels to provide greater maneuverability in tight spaces. On the inside, the F SPORT boasts bolstered sport seats and "race-inspired" instrumentation. Even if you use the GS 350 as a commuter car, you'll think you're Carl Edwards every time you jump in the driver's seat. Overall, the GS 350 is an excellent car that deserves a look from anyone in the midsize luxury sedan market. With aggressive good looks, bulletproof reliability, and features just about anyone would find luxurious, it's a heavyweight contender in the luxury game. 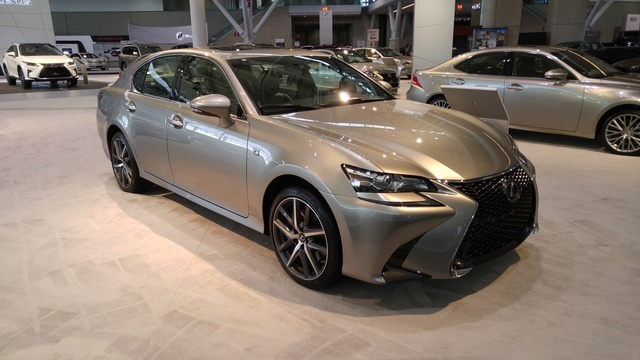 What's your take on the 2016 Lexus GS 350? Guru9X85R One of the best quality, best rides you'll ever have while on top of this planet. Look into it and test drive then you'll understand. Have you driven a 2016 Lexus GS 350? Are Any Lexus Certified Preowned? Lexus 350 Sport. New 2016. There is a orange circle, size of a quarter to left of odometer, comes on a couple seconds and goes away. What does that mean... does not appear every day?? ?